This is a brainstorming post: Simple things that anybody can do to be more safe and prepared for emergencies and disasters. Many preppers will have done many of these. Those that cost a lot of money are marked: (Expensive). These are in no particular order. 2. Purchase a CO detector. 3. Store at least a 2 week supply of drinking water. 4. Purchase a drinking-water-quality rain barrel. 5. Find a sheet on the Internet telling you how much bleach you need to purify questionable water and print it out. 6. Make it a habit to always have a jug of bleach on hand. 7. Get some N95 masks. 8. Assemble a basic first aid kit. 9. Take a Red Cross CPR class. 10. Check your spare tire for proper inflation. 11. Learn how to change a tire. 12. Purchase an extra battery for your cell phone. 14. Take a basic firearms safety class if you’re new to shooting. 16. Get out to the shooting range and practice at least a bit. 17. Store at least a two-week supply of food in your home. 18. Purchase a month supply of basic hygiene products: toilet paper, etc. 19. Purchase a small battery operated radio for receiving news. 21. Purchase a reasonably-priced backpack, your bug out bag. 22. Get a good pair of hiking boots. 23. Read at least one good book about wilderness survival. 26. If you have babies, purchase extra diapers and other baby supplies. 29. Plan at least two evacuation routes out of the city, if you live in the city. Know in advance where you’d evacuate to and who you’d stay with. 30. Take a basic self-defense class. 31. Begin a simple physical fitness routine. 32. Over a period of time, save at least one or two months worth of income to pay your bills in the event of job loss. 33. Assemble a basic “get home” bag to keep in your vehicle. If you travel in snowy areas, have a shovel in the trunk and a bag of sand. 34. Watch one or two videos on Youtube about burglary prevention which have been made by police departments. 35. Learn the basic physical signs of a stroke and a heart attack. 36. Purchase an outdoor barbecue and charcoal for emergency cooking outside. Treat your family to steaks and hamburgers. 37. Purchase a generator to keep your fridge and a few lights going in an emergency. (Expensive). 38. Safely store 5-10 gallons of fuel for your generator. 39. Purchase fire extinguishers for your workshop, basement, garage, and kitchen. 41. Get several reliable flashlights. Own at least one LED battery-operated lantern. 43. Get a mosquito-proof tent for bugging out in style. 44. Take a basic auto maintenance class to learn more about your vehicle or subscribe to richpin06a or EricTheCarGuy on Youtube. 45. Find out where your water shutoff and natural gas shutoff are. 46. Get a book about land navigation and learn to use maps and a compass. 47. Assemble a collection of rugged outdoor clothing: If you live in a Northern state, do you have adequate clothing if you’d need to be outside for an extended time? 48. Learn to swim and teach your children to swim. 49. Assemble a basic toolbox and learn more about repairing and maintaining mechanical things. 50. 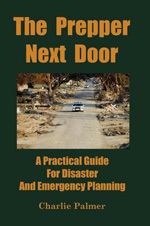 Purchase and read The Prepper Next Door: A Practical Guide For Disaster And Emergency Planning.